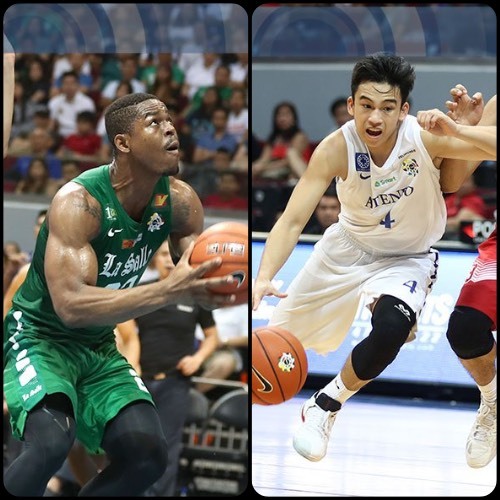 Hoop Nut #UAAP79 Adamson Ateneo Blue Eagles De La Salle UAAP UE #UAAP79 Roundup: Archers shoot down Falcons and Eagles swoop down on Red Warriors on Day 9! #UAAP79 Roundup: Archers shoot down Falcons and Eagles swoop down on Red Warriors on Day 9! Images by Arvin Lim/ABSCBN Sports. Day 9 had the DLSU Green Archers remain unbeaten after they shot down the Adamson Soaring Falcons. The Ateneo Blue Eagles, meanwhile, got back on the winning track by cruising past the UE Red Warriors. The De La Salle Green Archers cruised to another big win, disposing of the No. 2 team Adamson, 91-75, as they picked up a fifth consecutive win in UAAP Season 79 on Saturday at the Mall of Asia Arena. Ben Mbala dominated again with 21 points on 9-for-11 shooting alongside 16 rebounds and three blocks for La Salle, which furthered its lead atop the standings. Jeron Teng added 15 points – nine in the fourth quarter – while rookie Aljun Melecio exploded for 13 points in under 12 minutes of action for the Green Archers. Kib Montalbo also contributed with a well-rounded performance with 12 points, eight rebounds and a game-high six assists in the win. 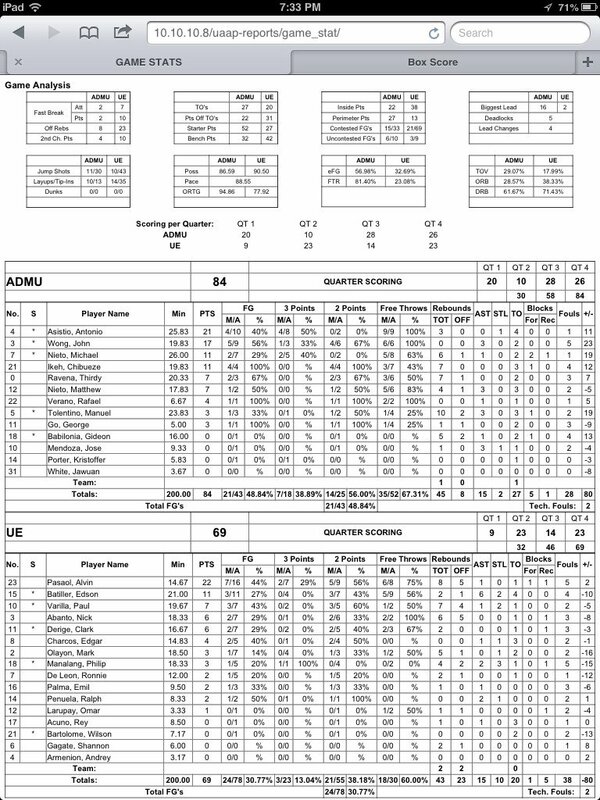 Ahanmisi led Adamson with 22 points while Robbie Manalang finished with 15 for the Falcons, who shot a better percentage from three-point range (11-for-32 for 34%) than two-point range (11-for-34 for 32%). Adamson dropped down to 3-2. Bem Mbala (DLSU) - 21pts, 16rebs, 2asts, 4stls, 3blks, 9/11 FGs. 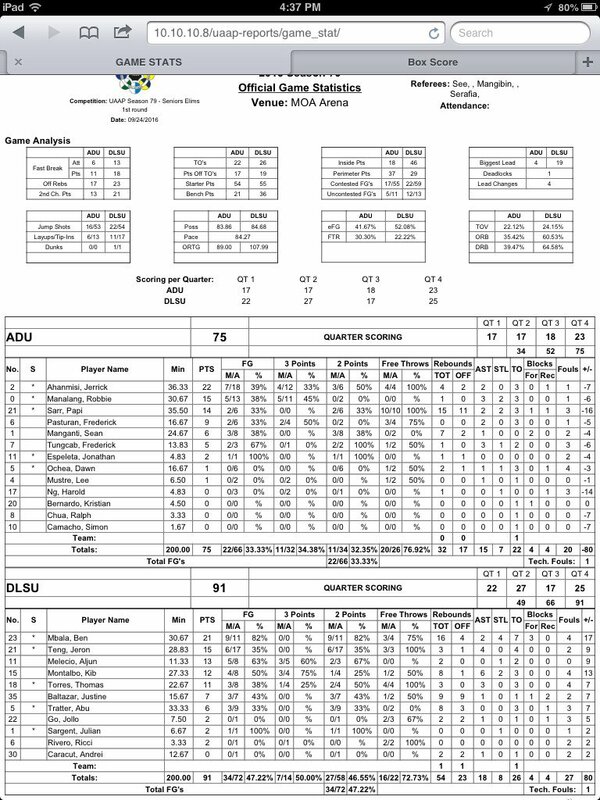 Papi Sarr (ADU) - 14pts, 15rebs, 2asts, 2stls, 1blk. The Ateneo Blue Eagles lost a big early lead but managed to hang on as they defeated the UE Red Warriors, 84-69, to move up the UAAP Season 79 standings on Saturday at the Mall of Asia Arena. Anton Asistio hit four three-pointers and shot a perfect 9-for-9 from the free throw line en route to a game-high 21 points while Adrian Wong tallied 17 before fouling out in the fourth quarter as they helped Ateneo climb up to 3-2, tying Adamson for second place in the leader’s table. Chibueze Ikeh and Mike Nieto each added 11 markers for the Blue Eagles, who bounced back from a tough loss in their previous game where they were beaten by a game-winner with 1.9 seconds left. Anton Asistio (ADMU) - 21pts, 3rebs, 1stl, 4 triples. Alvin Pasaol (UE) - 22pts, 8rebs, 1ast, 1blk, 2 triples.